I guess "delusional" is about the only word for it. During the long car ride back from Ohio last night, my mind began filling with lists: people to email, tasks to complete, projects to start, gifts to purchase. I grabbed a pen and filled half a sheet of paper with scribbled reminders, a few urgent items starred. Bright and early this morning, I dove in, selecting only the most time-sensitive and immediately necessary items to copy onto a to-do list for today. And then my toddler woke up, and we both faced the Monday Morning Reality Check: After five days of doting grandparents, plus Daddy being around, I was now the only source of attention for Elijah. Neither of us dealt with it well. Elijah whined. I snapped and seethed, impatient, irritable, resentful. I cried out for help, and snapped again, my morning an endless cycle of frustration, repentance, and repeated ugliness. I wished I could go to bed and start the whole day over again. 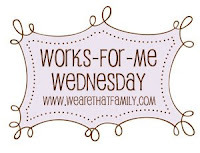 I stopped and confessed: Father, I am having such a hard time dying to self today. I remembered my own words: Elijah is not an interruption to my agenda...he is my priority. I thanked God that Jesus didn't pursue His own agenda, but instead prayed, "Not my will but YOURS be done." And during a brief phone call, I listened to a friend say, "On days like today, I just have to accept that I'm not going to get anything else done. I have to love on my kids and let the rest go." While Elijah napped, I ate leftover smoked turkey and apple-spinach salad and pored over wise words of grace and peace from Ann. When he woke up, still slightly grumpy and begging for "Leleplh" (his cousin, Olivia--"Leleplh" is my terrible attempt to spell how he pronounces "Livi"--he loves to watch the videos my sister-in-law has posted online), I sat here with him on my lap, trying to breathe slow and deep, letting go of the to-do list, thanking God for our widescreen monitor as I browsed in another window while clicking through all 68 video clips (most are less than 30 seconds). I scrapped my plans to package homemade cookies and take them to the post office this afternoon. I sat in the middle of the kitchen floor and read library books. I turned on "bebec" (music), and changed the song when it was apparently the WRONG bebec, and swayed and sang to my little grump. Then I thought of a conversation I had with a friend recently. She shared how her husband is (wisely) wary of blogging because of the way we women put our best foot forward, sharing the polished versions of our lives. "Why don't you ever post pictures of the house when it's messy?" he challenged her. I also thought of Ann Voskamp's ability to see beauty in the most mundane things. And so I grabbed my camera and documented a failure of a day. In this season when we all post warm, inviting pictures of our homes decorated beautifully for Christmas, I am inviting you to come tour my disaster. Don't get me wrong, I think those holiday photos are fun--a friend of mine posted hers just this morning, and I loved the virtual tour of her beautiful home! But here at the Kannel house, in between Thanksgiving recovery and the trimming of the Christmas tree (which is currently still in the basement), we're just going to be real for a moment. Let me help you feel better about your mess. Step in the back door and see three bags that need to be unpacked, library books strewn across the [ugly and in need of replacement] kitchen floor. The kitchen mess would be far more overwhelming if I used my wide-angle lens--but I was too lazy to change it. So now that whiny mess of a toddler is sleeping again (apparently needing to catch up after our trip), and instead of tackling my list, I'm taking the time to blog. Perhaps not the best use of my time--or perhaps (I hope) it will encourage someone today. Heaven forbid any of you ever come away from this blog with a polished, shiny picture of me. I am real. I am oh so flawed. And this is what my house looks like on a Monday after a weekend away. But I serve a God who makes the ugly beautiful...who brings order from chaos...who loves me even when I am a grumpy mess...and who has drawn my boundary lines in pleasant places, given me a beautiful inheritance--if only I will open my eyes to see it. This fall, we haven't been able to watch the games, but Elijah still knows who to root for. 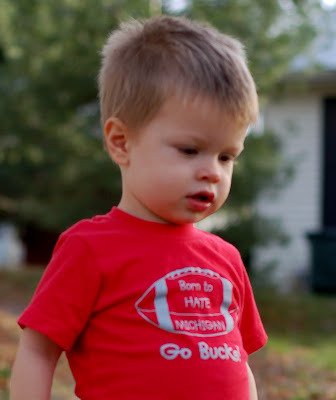 It would have been better to post this last weekend in honor of the big game against Michigan, but we wanted to wait until family members could see this shirt in person--especially Pops (who, as a Michigan fan, would hate it), and Uncle Duh (who, as an Ohio State fan, would love it). I have two completely unrelated websites to share today, one utterly practical and the other just plain fun. My first discovery is an online store called Vitacost. I ordered from them several weeks ago, and though I felt overwhelmed by the selection, I was thrilled with the prices and the service. This is now my go-to place for buying vitamins for our family. It's got much better quality vitamins than I can find at Target or Kroger, and at wholesale prices! It's also (as far as I can tell) the best price on the web for Nutiva extra-virgin coconut oil. The more I look around, the more I am suprised to discover how many items they carry. Recently I found low prices on Dr. Bronner's soap and Bac-Out there, and I believe they carry many mainstream health and beauty items--the same things you'd find at your local store, only probably cheaper, and tax free. Shipping is flat-rate (only $4.99), and I was able to find a coupon code that made my shipping free (check RetailMeNot.com). I plan to do more and more of my health-related shopping at Vitacost--from nutritional supplements to specialty food items to cleaners to cosmetics. Totally changing the subject...one of my favorite just-for-fun blogs is a photography blog called Little Moon. Amber Scruggs is a Virginia-based child and family photographer who specializes in natural light portraits. All her work is gorgeous, but the newborn shoots she does are absolutely breathtaking! Much as I would love it, I could never afford to have someone like her take photos of my family--so I just drool over her photos, and learn from her too (she does really helpful FAQ posts every now and then about her techniques, equipment, etc). When I was in college, one of my dearest friends taught me a philosophy that has served me well ever since: "Relationships come first." Pam said it early and often in our friendship, and I never forgot those three simple words--in fact, I passed them along to countless other college friends long after Pam had graduated. My schedule at college was packed--a full class load, a part-time job, leadership in the chorale, ministry team membership. But when I had to decide between writing a paper or having coffee and a deep conversation with a friend, the friend won every time. I'm not advocating irresponsibility; it's not that I was blowing off studying in order to watch a movie or play euchre with friends. Rather, I chose to prioritize meaningful investment in relationships--typically long talks over dinner or coffee--even if it meant staying up later to complete an assignment. If a friend needed me, it didn't matter if I had a test the next morning; I was going to put the relationship first. Pam modeled it for me right from the start. 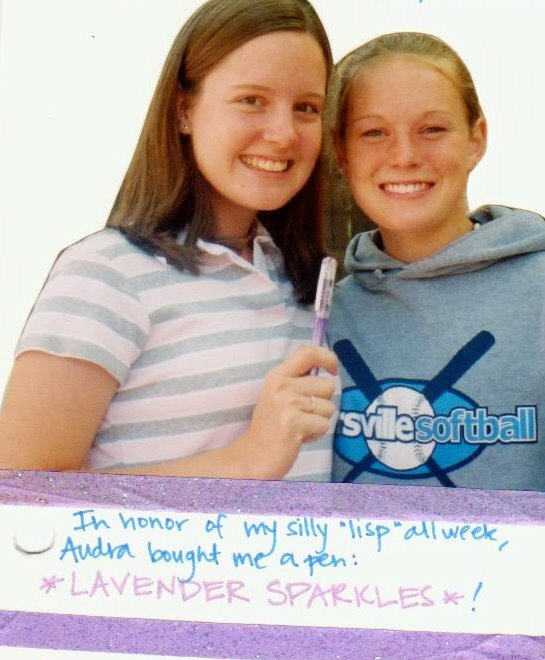 She was at least as busy as I ever was, yet when I, a timid, lonely freshman, asked her to "sort of mentor me" during her junior year, she made time for me. Wednesday night dinner with Pam was a given on my calendar every week for the next three years, I think. As she wisely pointed out, "In five years, what are you going to remember? The test material, or the friend you spent quality time with?" And you know what? She was right. I'm endlessly thankful for all I learned in the classroom during my four years of college, and there are a lot of things I'd do differently in terms of academics, to be sure. But I have never once regretted putting relationships first. What made the biggest, most lasting impact on me was not the ideas I pondered or the papers I wrote, but the people I learned to know and love. These days, I may not have assignments or deadlines, but it's still all too easy to be task-oriented instead of people-oriented. Many days I find myself more concerned with crossing items off my to-do list than with caring for my son. So as I reflect on my college years, I want to remind myself: Relationships come first. The most important relationships in my life are Steve and Elijah--and they must be a bigger priority in my mind, heart and day-planner than any of the tasks I need to complete. 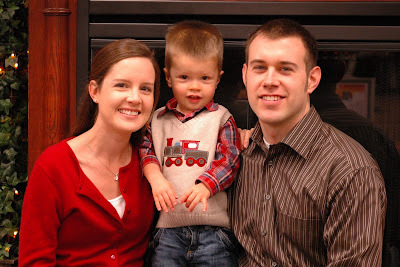 "...it's easy to lose sight of what ministry is really about. ...We get our minds too focused on tasks, when ministry is ultimately about people. I just want to constantly remind myself that people aren't an interruption to my work. They are my work." Four years ago, my dear friend Kelly inspired me to do a mega-thankful list for Thanksgiving: 100 things I'm thankful for. It's good to pile blessings on top of blessings and realize just how many reasons for gratitude I have, both big and small. A list of a hundred barely makes a dent in the pile. I can't remember now who suggested this to me--but I'm so glad they did. Maybe this is obvious to most people, but it was brilliant to me. It is one of the easiest, most effortless ways I know to be frugal, and all you need is a pair of scissors and a ziploc bag. You know those tubes of liquidy beauty items that stand on end--lotions and so forth? You figure that since they're standing on end, the lotion has settled at the cap and you're able to get most of it out. But there comes a point where you just can't squeeze hard enough, and you have to throw the tube away. No more. You will be astonished to discover how much lotion or makeup is still in that tube! And getting it out this way is much easier than wrestling with the tube to squeeze out the last drops. I first did this with a tube of body cream from Bath & Body Works. I simply cut the very top off of the tube with a pair of scissors, and used my fingers to wipe out the lotion that was stuck to the inside of the tube. When I got all the lotion from the upper part of the tube, I cut it off further down so I could use up the rest. And I stored the cut tube in a plastic baggie in between uses to keep it from drying out. Recently, I thought I was about out of foundation--but figured I would cut the top off and maybe get another day or two worth of makeup out. Wrong: I continued to use that tube for several WEEKS! It was a smaller tube, so I used a cotton swab to get the remaining foundation out. The next time you think you're just about out of lotion or foundation or something similar, cut off the top of the tube. It works for me! "Human sin is stubborn, but not as stubborn as the grace of God and not half so persistent, not half so ready to suffer to win its way." This must be my week for getting wonderful, unexpected treatment from retail stores! This afternoon I went to Whole Foods to look for a few unusual ingredients I knew I wouldn't find at Kroger. I just finally made it to Whole Foods for the first time a month or two ago, and oh, is that a grocery shopping experience. I so wish the closest one wasn't a 50-minute drive away...though maybe it's best for my grocery budget that it is! Why am I telling you all these details? I have no idea. You're used to it by now, I suppose. Most importantly, I had a few ingredients I needed for some baking experiments I plan to conduct this weekend (I'll explain more soon, if it goes well). I asked the first person I saw where I might find these, and he said that while the first two were across the street at Whole Foods Body, he would search for the coconut flour I wanted. A few minutes later, he came back with a little bag of the flour. "This is the only kind we have," he said, and paused. "Have you ever used coconut flour before?" I said I hadn't, and he continued, "because it's $7 for this little bag." I smiled and said that didn't surprise me, since I had priced it online. But he proceeded to cross out the barcode with a pen and say, "I'm going to give you this bag for free, so you can try it out and see if you like it." What?!? I totally was not expecting that kind of generosity! So I walked out of Whole Foods with a free bag of coconut flour, nine pounds of inexpensive, organic Cameo apples, a few pounds of high-quality grassfed butter, and all the ingredients for my kitchen experiment...and lots of goodwill toward/desire to shop at Whole Foods again. Yay for above-and-beyond customer service! this month's Desiring God CD: one of Piper's advent poems! After my run-in with a pumpkin yesterday (more on that later), I realized I was overdue for a CSA wrap-up post. We received our last share on November 6--no more veggies, but the last of the grass-fed beef and some eggs. One lasting benefit from this whole experience is that we are going to continue buying quality eggs from this farmer. At this point they are being delivered to our front door every Friday morning, which is really nice. So...with the CSA adventure now concluded, my wrap-up thoughts. I'm sure you've gathered that I'm disappointed with the whole experience. But first, the positives. I was glad to be able to support local farmers who are using sustainable, healthy growing practices. It could not have been much more convenient. And it was fun to experiment with herbs I don't normally use, vegetables I wouldn't ordinarily buy, etc. I loved that we were eating a variety of fresh, locally-grown, organic produce that was in season and optimally nourishing to our bodies. I loved knowing exactly where my beef came from and that it was way healthier than what I get at the store. I also have a relationship with local, like-minded farmers now, and the potential to get other things I need from them. I already mentioned the eggs, and we will very likely be purchasing chickens from them next spring (which I wouldn't have known about if not for this experience). My main frustration (as you well know if you've been reading all along) was that we received a whole lot less food than we expected--whether because of a misunderstanding, or because the farmer had a bad year, or both--and so that meant it was very, very expensive organic produce. We got a ton of fresh herbs and peppers, which, while nice, should have been a bonus to the food, not a replacement for the food. I can't exactly serve a side dish of sage, you know? Much of what we received was also unusually tiny, except in one case. And that leads me to the pumpkin. It just kills me that things we expected to be normal-sized (carrots, bell peppers, eggplant, tomatoes) were strangely small...and then, the one thing that we would have *wanted* to be small (the pumpkin) was huge. Oh, the irony. (I'll explain in my next post why we wanted a small pumpkin.) And some of the things we would eat, weren't very good quality. The watermelon we got wasn't all that tasty (we were getting better ones at Kroger), and the sugar snap peas we got several times were really bitter. So all in all...I would not do it again with this farm. I'm pretty sure I could have done better by driving 40 minutes to the Nashville Farmers' Market, even factoring in gas money. Of course, this was lots more convenient, and I also don't know about the growing practices of the farmers downtown. But we did end up with a lot of stuff we didn't particularly like or care to use, whereas at the farmers' market, I can buy what we like best and will eat. Mostly I wish we could have a garden--not because I enjoy gardening, but because it is a much more cost effective way to get fresh organic produce--and you can choose exactly what to plant. But as long as we live in this location, that's not an option. I'm not sure what we'll do next summer. I still really, really like the idea of voting with my dollars and supporting local, sustainable farming. I don't even mind paying a premium for that kind of food (just not an *excessive* premium). So we may give the CSA concept one more shot (there's a bigger, more established CSA in the area--the one we almost signed up for before we found out about this one), or we may just be deliberate about frequenting farmers' markets and produce stands next summer. At any rate, thanks for hanging in there with me through this experience...much to the relief of some of you, I am sure, I am all done talking about it now. Except for the pumpkin post (which is only marginally related). I love my crockpot. Not as much as she does...but I really do love it. The more I use it, the more I want to use it. There is something so satisfying about doing all the work and making all the mess for dinner in the morning--and then not having to lift a finger at dinnertime! I was eager to join in, but wanted to post an original recipe--not one that I'd simply tweaked slightly from A Year of Slow Cooking. So on Sunday, I made my first attempt at modifying white chicken chili for the crockpot. This recipe is adapted from Allrecipes.com, but I've changed almost everything about it, so I can definitely call it my own. I'll confess, I'm not 100% satisfied with it--but it does work, it is healthy, and we happily eat it here. I'd love to hear from you if you try it out and tweak it to make it better (or if you have any tips based on your own white chicken chili recipe!). This recipe is easier if you use canned beans--because then you can do it all at once rather than in two parts. But it works well with dried beans, if you don't mind having to come back to it a couple of hours before serving. The night before: Measure the dry beans into your crock and add enough water to cover, plus an inch or two. Soak at room temperature overnight. In the morning: Dump the soaking water and rinse the beans. Add broth and onion and cook for 5-7 hours on low. With a slotted spoon, remove about half the beans (more or less--no need to measure) and puree them in a food processor or blender. Return bean puree to the crockpot and add chiles, chicken, corn and cumin. Turn crockpot up to high and cook for another 1-2 hours; taste it and adjust seasonings to your liking--add some salt, and a pinch of cayenne or some jalapenos if you want some kick. Serve plain or with toppings: sour cream, shredded cheese, salsa, tortilla chips, etc. If you want to simplify and use canned beans, just skip the soaking step, puree about 2/3 of one of the cans at the very beginning, and then dump everything in the crockpot on low for about 6-8 hours. 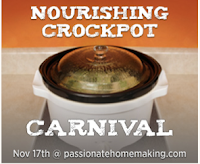 Visit Passionate Homemaking for more nourishing crockpot recipes. I haven't hesitated to use this blog to complain about poor customer service--so I also don't want to hesitate to use it to applaud companies whose service is impressive. Today I am blown away by an email I just received from Westminster Bookstore, the campus bookstore for Westminster Theological Seminary. A while back, I discovered that WTS Books has fantastic prices on many of the books Steve and I shop for--in many cases, they are lower than Amazon. And they charge a low, flat rate for shipping rates: $4 UPS shipping for orders over $35, and for orders under $35, you can use $3 USPS economy shipping. I write to apologize about the delayed shipment of your order of CrossTalk. We experienced overwhelming demand and sold out of our initial 2,000 copies much more rapidly than expected. To add insult to injury, we did not make adequate arrangements to rapidly replenish stock. While we are still in the promised delivery time frame with your order of 1-3 weeks, the delay in shipping your product is unacceptable to us. We will be crediting your credit card the $3 shipping charge as a token of our apology. The Lord provided our second shipment of 2,000 copies today and so we hope, God-willing, to get your order out today. WOW. Is that crazy or what? In my view, the refund was unnecessary, but certainly very appreciated. I am astounded by this kind of proactive, generous customer service. And I thought I was getting a wonderful deal by paying $7.97 including shipping for the book (it's now $10.39 at WTS Books and $15.99 at Amazon)...but now it turns out I get it shipped to me, brand-new, for less than five bucks! You can't beat that, friends. So, all that to say, I highly, highly recommend checking out Westminster Bookstore for your holiday shopping (is it really time to be thinking about that already?!) --and for all your online book-buying. I realized at about 2:30 this morning that I hadn't put up a blog post in the insanity that was yesterday. Sad! I was so hoping that this would be my year to win one of the awesome prizes. The last three years, I've accomplished the goal, but not been selected for a prize. So probably, this year I'll be randomly selected and then be disqualified for not having posted every day. Argh! On the bright side, I haven't yet seen this year's prize list--when I first looked it up before NaBloPoMo started, it only contained one or two things that did not appeal to me. Now I'll just avoid looking so as not to torture myself. I still plan on posting every remaining day in November. I've got a lot of ideas floating around in my head, both my own and ones you suggested. Yesterday was just so crazy that I did not have any time to post, unless I'd gotten on the computer at 10:45 when I got home--and at that point, the only things on my mind were bed, and my poor toddler with a horrible, barking cough. What I *shouldn't* be sad about is the fact that real life took me away from the computer. Too often it is the other way around--the computer is a huge distraction from the people and tasks that are present right in front of me. So in reality, it's a GOOD thing that I was so busy living and loving right here and now that I wasn't thinking about the world of blogs! That's not "distraction"--that's called "right priorities." A helpful reminder, I guess--that NaBloPoMo should serve me and my family, not rule my life. And the main reason I wasn't on the computer yesterday is because I was spending time with one of my dearest friends: the lovely Pamela Terry! Pam and I went to college together, and she is now singing with the U.S. Army Field Band & Soldiers' Chorus--who were on tour in Nashville this week! After Thursday night's concert, Steve and I brought her home with us, and she and I stayed up until after 1:00 AM talking. Pam spent a few hours with Elijah and me in the morning, then we took her back downtown to catch her bus. I'm so glad we got to see her for a quick visit...even if the conductor did cut her solo at the last minute (boo). After we dropped Pam off, Elijah and I went to Centennial Park to enjoy the beautiful weather. We fed the geese (which he got a huge kick out of...WHY didn't I take my camera?!) and he ran off a bunch of energy before we came home and crashed. I woke up from a long, much-needed nap with barely enough time to scramble and get things around to pick up four other ladies and go to a baby shower. "...I find my delight in your commandments, which I love. I will lift up my hands toward your commandments, which I love, and I will meditate on your statutes" (Psalm 119:47-48). heavy blankets on cold mornings. of what it means to love You. the delight that has to be pursued, uncovered, found. the glorious gospel of grace. Haven't done one of these since September! As always, if you'd like to play along, credit goes to The Simple Woman's Daybook. box elder bugs. Three of them crawling across the glass at the moment. They have begun their annual invasion of our back patio--though there are much, much fewer of than last year, which makes me think my ruthless killing of the eggs in the spring was effective. Yesssss. about natural living, going green, simplifying, avoiding toxins, etc. Wondering where the balance is between being an informed, educated consumer and living in fear...wanting to make wise choices for my family without spending a disproportionate amount of time or mental energy researching and pursuing these things. Considering buying some Soap Nuts. my best friend Julie and her husband, Mike, who made the long drive down here from Ohio to visit us over the weekend. I'm also thankful for Mike's servanthood in 1) helping Steve hang drywall upstairs, and 2) keeping all three boys (two were sleeping the whole time) so Julie and I could go for a long, stroller-free, uninterrupted-conversation walk yesterday morning before they left! trying to resist eating too many pumpkin chocolate chip cookies. I made them Sunday night, and they get tastier after a day or two. I've also got an entire crockpot full of sweet potato casserole in the fridge that I have no idea what to do with. I made it last night for Steve to take to work today for a staff potluck...and it turned out he didn't go today (see below). to take a walk with Elijah in this GORGEOUS weather--I just can't get over how wonderful the temperature has been the last couple of weeks!--and to talk on the phone with my mentor, Diane, later this afternoon, yippee! to find a productive, meaningful way to use all the time I have been carving out to work on my class. It's all over now, but since I know I can find several hours in the week to listen to lectures, read and work, I want to keep setting aside that time to accomplish other projects and not just absorb it into my week and waste it. I'm also hoping to take another class from CCEF eventually! absolutely nothing...for whatever reason I never think to turn music on while I'm at the computer. my poor husband is upstairs sleeping. The only thing worse than working an odd shift is working first shift AND third shift in the same day! He got home from work around 4:30 yesterday...only to get a phone call at 9:30 last night and, after an hour of troubleshooting from home, end up going back in. He didn't get home until 7:45 this morning. Tomorrow's playdate is going to be downtown, where we'll catch the Veteran's Day parade and hit up the Frist while it's free. I've never been there, so that should be interesting. Then on Thursday, I get to see one of my very dearest friends from college! Pamela is in the U.S. Army Field Band Soldiers' Chorus, and they are on tour in Nashville this week! So I'm planning to go to her concert on Thursday night and then bring her home with me to spend the night here. Can't wait to see her and catch up. And Friday, I'm going to a baby shower. I've had a couple of requests for my banana bread recipe recently (previously mentioned on the blog here and here). This is my go-to quick bread, my favorite way to use up overripe bananas. It's a big hit with the guys at Steve's work :) No pictures to entice you, unfortunately, as I haven't made it lately. The original credit for the brilliance of putting chocolate on banana bread goes to the Mahaney women over at GirlTalk--ever since printing off this recipe from their blog a few years ago, I've become firmly committed to the belief that the ONLY way to eat banana bread is with chocolate either in it or on top of it. I've changed the recipe quite a bit, though, including recent attempts to "healthy-ify" it. It's a pretty flexible recipe, so I'll note variations that have worked for me. Preheat oven to 325*. Beat butter/oil and sugar. Add eggs, sour cream, vanilla and bananas and beat until blended. Stir together dry ingredients and add to wet mixture until blended (do not overmix). Pour into greased bundt pan and bake at 325* for 45-50 minutes, or until a tester comes out clean. Allow to cool in pan for about 15 minutes, then remove from pan and cool completely. To glaze, melt 1/2 c. chocolate chips and 3 T butter in microwave (on 30% power) or on stovetop (over low heat). Pour over top of bread. Is he getting big or what? I still remember the fruit of the Spirit by mentally humming a couple of lines from a song I learned in Vacation Bible School way back when: "You gotta have love. Joy. Peace, patience, kindness / For this is the fruit of God's Spirit! You gotta have goodness, faithfulness, gentleness and self-control / For this is the fruit of God's Spirit!" But now I've found some fruit of the Spirit music I like a WHOLE lot better. It won't help me remember the list in a catchy way--but the songs are much cooler :) And more importantly, they remind me HOW the fruit of the Spirit grows in my life. 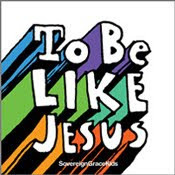 "Through these songs kids will learn that Jesus is our perfect example of love, joy, peace, patience, kindness, goodness, faithfulness, gentleness, and self-control. More than that, they’ll discover that we can’t be like Jesus unless we trust in the power of his cross to forgive us and the power of his Spirit to change us." I think Mama needs these lyrics much more than Elijah at this point! We borrowed this CD from a friend (thanks, Lydia!) and the more I listen to it, the more I like it. And Elijah likes it, too--he has started picking up one or two words in the chorus of a couple of the songs. Definitely will be adding it to his Christmas wishlist. These gospel-centered songs are the kind I want my son to grow up singing--the kind that point him not to his own strength, but to the grace of God in Christ. He, not we, can produce the fruit of the Spirit in us! You can buy the CD here for only $12--and it's an enhanced version that includes accompaniment tracks, how cool! Or, the mp3 download set is only $9.